Fernando Hierro at the World Cup. FERNANDO HIERRO WILL not continue as Spain coach, or return to his previous role as sporting director, following the World Cup, the Royal Spanish Football Federation (RFEF) has confirmed. 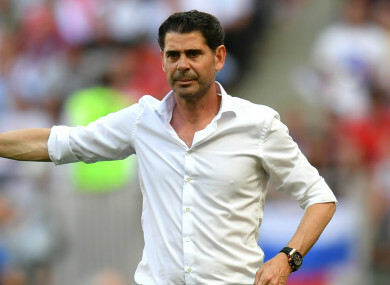 Hierro stepped up to become interim coach after Julen Lopetegui was sensationally sacked on the eve of the World Cup following the announcement he was to take charge at Real Madrid at the end of the tournament. Spain subsequently qualified from the group stage but went out to hosts Russia at the last-16 stage following a penalty shoot-out in Moscow. Hierro was not expected to continue as coach after the World Cup but the RFEF has announced he will not stay with the organisation in any role. “The last Spanish coach declined to return to his previous position as sports director of the RFEF to seek new horizons and undertake new professional challenges,” the RFEF said. “The RFEF wants to thank Fernando Hierro for his commitment and sense of responsibility when he took over the national team in extraordinary circumstances as well as in the performance of all his duties. Roberto Martinez, who has led Belgium to the semi-finals of the World Cup, is among the coaches to have been linked with taking the Spain role. Martinez played down the links ahead of a quarter-final defeat of tournament favourites Brazil, with former Barcelona coach Luis Enrique also reported to be on the RFEF shortlist along with Michel and Quique Sanchez Flores. Email “Fernando Hierro quits Spain role after World Cup disappointment”. Feedback on “Fernando Hierro quits Spain role after World Cup disappointment”.